In a high-profile case with potentially national implications, a San Mateo County Superior Court judge sided in September with Cotchett, Pitre & McCarthy client Surfrider Foundation and ordered Silicon Valley billionaire Vinod Khosla to stop blocking public access to a Northern California beach used and enjoyed for nearly a century by families, fishermen, surfers, and other members of the community. Khosla had gated off a road leading from Highway One to the beach in 2010, two years after buying most of the land fronting the beach for $32.5 million. In siding with Surfrider, Judge Barbara J. Mallach held that Khosla – via two companies he apparently created to manage the property – violated the California Coastal Act by locking a previously installed gate, installing signs warning would-be visitors not to use the access road, and hiring armed guards to prevent members of the public from attempting to reach Martin’s Beach. In finding that these alterations of the property constituted “development” requiring a Coastal Development Permit (CDP) under the Coastal Act, Judge Mallach affirmed that owners and possessors of coastal property must pursue a CDP whenever they alter the “intensity of use” of a property – even if these alterations involve no physical changes to the land or its artificial features. While Khosla has not announced whether or not he intends to appeal the decision, he had previously framed the case as a referendum on property rights and takings law, with public support from such conservative policy groups as the Pacific Legal Foundation. Regardless, Judge Mallach’s ruling did not foreclose Khosla from applying for a CDP authorizing the developments he had illegally implemented. 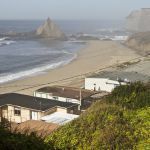 Were Khosla to do so, the California Coastal Commission, which regulates all development on or near the state’s 1,100 miles of coastline, would then consider whether or not to approve the application. Meanwhile, the Martin’s Beach situation is playing out in other arenas: In a separate legal challenge brought by surfers who use the access road to reach the beach, another San Mateo County Superior Court judge ruled in October 2013 that Khosla’s property is exempt from the California Constitution’s guarantee of coastal access because it did not contain a public easement to the beach when the United States acquired California from Mexico in 1848; that decision, based on a rationale that suggests former “rancho” properties statewide may be exempt from bedrock state constitutional provisions, is under appeal. More recently, California governor Jerry Brown signed into law in September a bill ordering the State Lands Commission to engage Khosla in an attempt to simply buy a public easement over the access road. The law also requires the agency to consider using eminent domain to establish a public easement over the access road if these negotiations fail to produce a purchase deal by January 1, 2016. (The State Lands Commission has never before used eminent domain to seize private property for the benefit of the public.) Lastly, the Coastal Commission is studying whether or not the public’s long history of using the access road cutting through Khosla’s property to reach Martin’s Beach has established a prescriptive easement. If the Commission were to conclude that such an easement exists, the newly mandated negotiations by the State Lands Commission would likely become moot. Adopted in 1976, the Coastal Act elaborated on the promise of Article X, Section IV of the California Constitution that those who own or possess property fronting navigable bodies of water may not “exclude the right of way to such water whenever it is required for any public purpose.” The Act, passed under Article X’s directive that the Legislature “enact such laws as will give the most liberal construction to this provision,” was designed to “[m]aximize public access to and along the coast.” Judge Mallach’s ruling in the Surfrider suit concerning Martin’s Beach simply affirmed the straightforward and longstanding expectation that anyone who wishes to block or otherwise impede coastal access first apply for, and receive, a development permit from the Coastal Commission. Unfortunately, the Coastal Commission is at present dramatically underfunded, which translates to a dearth of enforcement personnel prosecuting violations of the Coastal Act. (By way of illustration, the Commission now has almost 100 fewer staff members than it did in 1980; the result is a backlog of around 2,000 reported coastal use violations.) Under this reality, the Coastal Act’s “citizen-suit” provision – which allows any Californian to sue in state court to stop or reverse a coastal use violation – takes on new importance, and now appears to present the fastest route to stop coastal violators in their tracks. If you have any questions concerning the Martin’s Beach matter or your fundamental rights to coastal access and protection under the California Coastal Act, or if you have knowledge of a potential violation of the Act and wish to discuss your legal options, feel free to contact Cotchett, Pitre & McCarthy attorney Eric J. Buescher at 650.697.6000 or ebuescher@cpmlegal.com. The Martin’s Beach case was Surfrider Foundation vs. Martins Beach LLC et al., case number CIV520336 in San Mateo County Superior Court. Joseph W. Cotchett, Paul N. McCloskey and Mr. Buescher represented Surfrider in the matter.